Series of openings is ongoing as we’re writing, so please don’t mind that we’re a week behind with this stadium’s presentation. It’s still weeks before the last “opening game”. Following our turbulent visit to (still beautiful!) Turkey last week, we’re only now adding the latest Austrian stadium to StadiumDB. While we’re a week behind the opening game against Chelsea (2:0 for Rapid), it’s only been a day since the official league inauguration (5:0 against SV Ried). Both games attended by well in excess of 20,000 people, proving that Rapid opened a well-tailored stadium. Third “opening” comes on August 4, when the first Europa League game comes to Allianz Stadion, the return leg against Torpedo Zhodino. As this impressive streak of opening events goes on, we’d like to say there was also a long and turbulent build-up to the stadium being opened, but no. In fact, it was very… rapid, disciplined and well-executed. 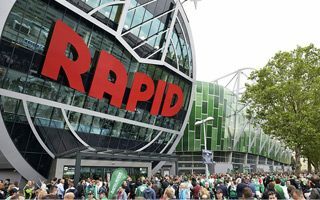 Contrary to its predecessor on the site in western Vienna, the new stadium for Rapid was built within extremely tight schedule. From first renderings in June 2014 it was just two years until opening, leaving barely 17 months for construction. Barely, because at under 30,000 capacity the sheer size is challenging. Even if most of the structure was prefabricated and only assembled on site (below comparison presents construction in mid-2015). Only one floodlight mast was left of the old Gerhard-Hanappi-Stadion, not as part of the lighting system but a reminder of the past. The field could not have been left due to the new stadium’s rotation by 90° to the more optimal north-south axis. This also meant demolition of one of four training fields, but the loss was somewhat compensated by massive increase in stadium floor space, let alone the capacity boost of 10,000 compared to 2001-2014 size. The simple and robust stadium bowl is clad with a mosaic of translucent green panels, partly covering also the roof and allowing the interior to be lit with green light by day, while emanating green on the outside during the night. Perhaps most outstanding is the cylinder-shaped main grandstand’s building, housing the club offices and extensive corporate facilities. Its southern façade is shaped to resemble Rapid’s club crest, providing a truly impressive main entrance to business partners. And it’s mainly business revenue that drove Rapid to build the new stadium. In order to boost its matchday and business-event profits the new building offers two levels of corporate facilities, including 41 private boxes, 2 larger lounges and nearly 2,500 business seats. This means 10% of the stadium is business-dedicated and the number of skyboxes is unmatched across Austria. Rapid was also successful in securing high-profile naming rights deal. The decade-long partnership with Allianz (until 2026) was helpful in securing the new stadium’s budget, eventually estimated at €53 million. Some 40% (€20m) came from the municipality of Vienna, while remainder had to be covered by Rapid and their partners. Though it should also be said that the intensive commercialisation alienated some supporters from identifying with the project. A threat of boycott appeared on the horizon, in the end minimized with a compromise. The stadium also has a non-commercial name Weststadion (based on the site’s location and tradition), while the address includes Gerhard Hanappi, architect and nameholder of the previous ground. Fans also received a massive number of 8,500 standing places, mostly in the vast south stand. Some have been reserved for travelling supporters, in the north.